This triptych was in the collection of Langton Douglas where it was recorded in the early 1930s, catalogued as a work by the Tuscan painter Vigoroso da Siena. It was acquired for the Thyssen-Bornemisza collection after having been offered to the National Gallery of Ireland. The triptych appears in catalogues of the Villa Favorita up to 1969 as an autograph work by Vigoroso da Siena, although Heinemann questioned this attribution. The current attribution was proposed by Miklós Boskovits, who stated his disagreements with the previous attribution in letters of 1982 and 1987. The central panel of the triptych depicts a Virgin and Child based on the Byzantine type known as the Panagia Hodigitriaor “Virgin who Shows the Way”, although Christ is presented here as The Word, indicated by the roll of parchment that he holds in clear allusion to the Gospels. The Virgin and Child are set beneath a semi-circular arch with an Annunciation scene in the spandrels. The lateral wings of the triptych depict four scenes from the life of Christ on each side. The left wing, from top to bottom depicts The Nativity, The Presentation in the Temple, The Transfiguration, and Christ before Pilate. On the right wing we see The Crucifixion, Noli me tangere, The Ascension and Five Saints. The overall approach of the triptych remains Byzantine not only with regard to style and technique but also in the iconography selected for the biblical episodes. The Nativity, for example, takes place in a cave with the Christ Child swaddled and the Virgin shown lying on a cloth rather than adoring the Child, in the traditional western manner. Saint Joseph is presented as distant from the principal event, seated in a corner and looking at the central group. In the right hand corner of this panel we see another episode traditionally found in Byzantine art, that of the Christ Child being bathed. Here the two midwives Zelomi and Salome take charge of the baby, who has already grown, one of them pouring water into the bath while the other, with the Infant Christ on her lap, checks the temperature. The artist follows traditional models, placing the figures and settings on a gold surface. The elements that form the backgrounds to the narratives have been simplified and are created from schematic elements. This is evident in the schematic trees in the garden, which acts as the setting to Noli me tangere, the rocks suggesting a natural landscape in The Nativity and The Transfiguration, and the simple architectural forms in The Presentation in the Temple, which are used to refer to an interior. 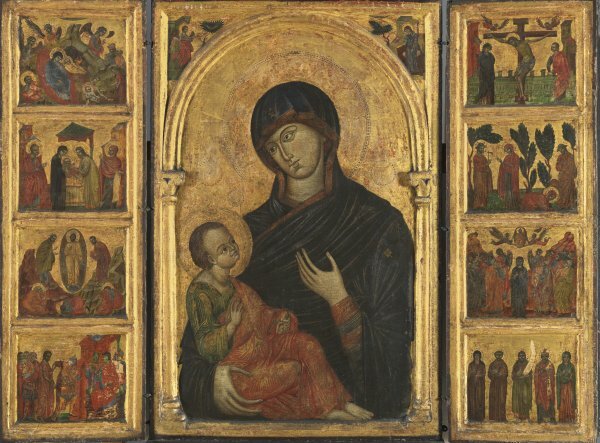 Boskovits tentatively suggested the creator of this triptych to be the Master of Santa Chiara. He grouped a series of works around this anonymous artist, including a triptych in the sacristy of the church of Saint Francis in Zara, Dalmatia, whose three panels depict the same subjects as the present work.